My last post about Green not being allowed in a Protestant Glaswegian household prompted a variety of responses, mostly about green bringing both good and bad luck. However one response was far more alarming. It came from a friend who is a Consultant Anaesthetist and centred on the reactions of doctors in Northern Ireland to certain colours. 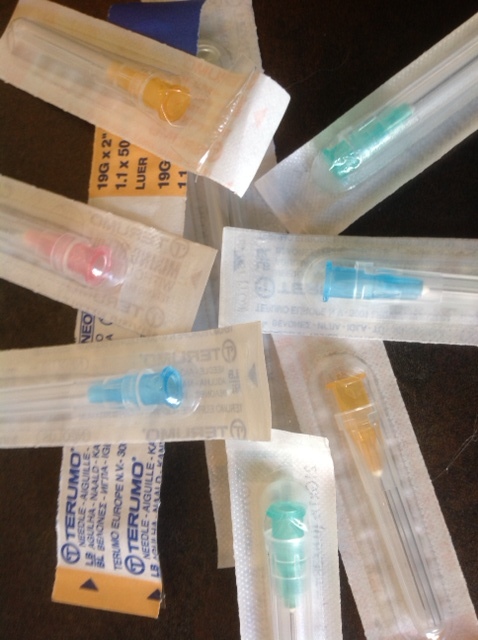 In order to give local anaesthetic to a patient to numb an area of skin or to give a deeper nerve block like an epidural or spinal anaesthetic injection, an order of increasingly larger needles is used; these needles are colour coded according to size. For the initial local infiltration a small needle is required; for the subsequent deeper local anaesthetic a larger needle is required. 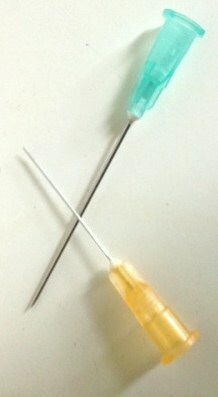 Normally, this larger needle is only used after the smaller needle has been used to numb the area. The needles are colour-coded thus: Orange for the initial injection and Green for the subsequent one. Well anyone with knowledge of Northern Ireland is probably already hearing alarm bells. You could not pick two more inflammatory colours in Northern Ireland than green and orange. As outlined in my previous post, Green is the colour that signifies to the Catholic Irish their homeland, wherever they may be in the world. Witness the extraordinary green lengths the US goes to when celebrating St Patrick’s Day – anything from green Guinness to green rivers. The Orange is a completely different matter. It is the symbolic colour of the Protestant faith in Northern Ireland. The Protestant Unionist Orange Order of Northern Ireland is so named in memory of the Battle of the Boyne in 1690 where the troops of William of Orange were victorious, ensuring Protestant supremacy in England, Wales, Ireland and Scotland. (From the 16C orange has been the political colour of the House of Orange-Nassau in the Netherlands. It is also the national colour of the Netherlands.) In commemoration of this battle, The Orange Order parades in orange sashes every 12th of July. The upsetting thing about these colours being attached to the relevant needles is that, owing to the continued Sectarianism in Northern Ireland, some Catholic doctors refuse to use the orange needles and some Protestant doctors refuse to use the green needles. This translates into these doctors feeling more strongly about a certain colour than they do about the safety or comfort of their patients. If you happen to be treated by a Catholic doctor with such allegiances, you run the risk of not having the initial (orange) injection and therefore having to suffer a painful, more powerful injection with a larger needle (green). If treated by a Protestant doctor, you run the risk of never having the deeper anaesthetic injection (green) and having to rely purely on one superficial and, perhaps, insufficient injection (orange). I started this blog because I wanted to examine the emotive power of colour. Wow, Francesca, I never would have realised this could happen in any hospital. I’m glad I’m having my knee done over here (26th June). I love reading your blogs. Keep up the great work. Absolutely fascinating. I had never thought that colour might actually impact on health, at least in that kind of way. I’m sure your readers around the world will come up with other examples. I would love that – I think … It’s a dreadful thought, isn’t it.